Barns and three sided shelters will offer needed shade in summer and, in the winter, protection from wind, snow, or rain. Usually a three-sided run-in shed can satisfy the basic needs of your alpacas. For very cold climates, an enclosed barn will offer protection for the winter months, a must for cria care. You will need some form of perimeter fence, preferably at least 5 feet, to keep out predators. Alpacas will not try to escape a fence. We also recommend guard dogs to keep out wild dogs or coyotes. 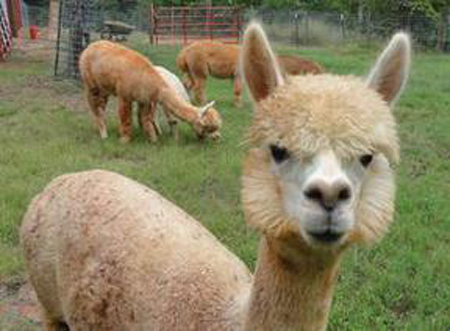 The pasture land requirements for an Alpaca herd are relatively low. Seven to nine alpacas per acre are the standard. However, you will need separate pastures for breeding males, breeding females, and weanlings/juveniles. Cleanliness is important for sanitation, and a regular cleanup of manure is important. Alpacas will habitually all use the same spot which makes clean up an easier. Some owners add the Alpaca waste to their compost pile for later use in improving soil. Good grass hay is sufficient. Alpacas consume around one to two pounds a day, Bermuda or orchard grass is typical. 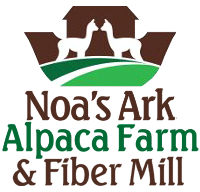 Alpacas also need a grain mixture with mineral supplements, as well as a continual supply of fresh, clean water is a must. You will need a small area near the barn or shed to pen your alpacas to provide necessary maintenance and health checks. Alpacas can be taught to enter this area when instructed.. A good size for a pen is nine feet by nine feet. Alpacas are hardy animals that require little veterinary care, and are usually disease free. However, Alpacas can get some diseases carried by other animals and must be vaccinated yearly. Alpaca owners need to be concerned with white-tail deer, as they carry meningeal worm, which can be a danger to alpacas. Treat the alpacas monthly for worms using Ivomec. Also vaccinate for rabies and CDT yearly. Keeping accurate health records is of utmost importance. Alpacas are fiber-producing animals and most breeders shear once a year in the spring. Alpacas with proper jaw alignment rarely need their teeth trimmed. If front incisors stick out beyond the top gum line, they may need to be occasionally sawed. Fighting teeth, if developed in males, may need to be cut off to prevent injury to other alpacas. Alpacas have a padded foot with two toes. Their toenails will need occasional trimming if not worn down naturally. If the nail bends over the side of the pad or protrudes, it should be trimmed. Since most Alpacas are kept in grass pastures that do not wear down, nails twice a year trimming is recommended. A scale is needed to weigh the cria when born, and also for weighing adults. Keep good records for each of your animals for health and proper feeding habits is important. You are going to need some items for your alpacas, especially for moving them around. Halters, leads, and sorting wands are the basics. You will need to keep alpacas cool in the warm climates, using large industrial fans, shade trees and three sided shelters, and even sprinklers. Alpacas are good natured and friendly and will follow you right into the barn or pen where you feed them. Your time spent with these gentle and beautiful animals will be very satisfying and memorable. For further information or to schedule a farm visit please feel free to contact us any time.